La série Dark Mirror a été updatée, avec le Chapitre n°5. En résumé : On apprend les noms des outils de Toa Kualus et Toa Bomonga, la lance de "sous-zéro" et la lance sismique. 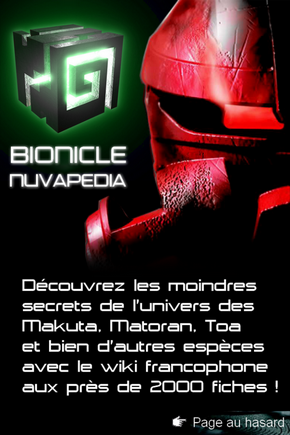 Takanuva apprend également que Toa Bomonga a tué Brutaka auparavant. Toa Takanuva had experienced many strange things since arriving in what he now knew had to be some kind of alternate universe. But nothing quite equaled what he was experiencing right at the moment: the sensation of flying under his own power over a vast stretch of ocean. Even stranger was the fact that he had Makuta to thank for this ability. After telling him roughly where to look for the caravan that would be carrying the Mask of Time, Makuta Krika had commented that he would never be able to intercept them in time by sea, even if he managed to steal a boat and slip away from Metru Nui. Flight was the best choice. Before Takanuva could argue that he didn't have the ability to fly, Krika had blown a fine powder into his face. The Toa of Light couldn't help but breathe it in. With a laugh, Krika explained that he had just been exposed to a Makuta Virus, which would, at least temporarily, give him the power of flight. If it had any other side effects, Krika chose not to say. Takanuva didn't know whether to thank him, or hit him. "Who are you?" said the black-armored warrior, "Speak or face the power of my Seismic Spear." "Lower your weapons," said the Toa of Light, "My name is Takanuva, I am here on business of the Empire." "I am Toa Kualus," said the white-armored Toa, "My surly friend is Toa Bomonga; and what might your business be, Takanuva?" "I don't trust him," said Jaller. Takanuva barely recognized him in his red Kanohi Komau. "Kodan keeps a record of every Toa in the universe, and I've never seen his name before." Takanuva fired a thin beam of light at Jaller, shooting the reigns out of his hands. Pewku, the Ussal crab, reared up, startled. The Toa of Light thought fast, "Have you ever heard of... Takutanuva?" "How about Graalok the mighty Ash Bear?" Bomonga and Kualus glanced at each other, then Kualus shrugged, "Very well, brother, you may travel with us to Metru Nui, but since you're so powerful, why don't you walk in front of us? That way you can meet any challenge head-on. Incidentally, who is this that plans to steal this mask from us?" "And well I should," said Bomonga. He plunged his spear into the ground next to Takanuva's lance, "After all, I killed him." donc si j'ai tout bien kapisch,les toa Hagah sont aussi corrompus.dommage...sinon,y'a rien d'autre dans ce chapitre? tien je savais pas brutaka a ete tue....quelle CHOC. Seulement celui de l'autre dimension. Notre Brutaka est toujours là heuresement. Bon chapitre. Mais je suis tombé sur le cu* quan j'ai appris la fin @.@ ! Je le pensais pas si doué. Quand est-ce qu'il y aura un concours pour les représenter? Pourquoi est-il question du Vahi si le Grand Cataclysme n'a jamais eut lieu. Ne devrait-il pas être inexistant ? Donc voilà pourquoi il est dans Dark Mirror. Ici, le Vahi a été crée par Artahka. au fait,à quand la traduc'?